Before I ever touched a set of polyhedral dice, I read the Endless Quest books from TSR. 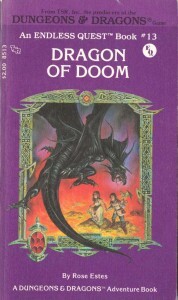 My mother had purchased a set of them at a yard sale based purely on the fact that they had dragons and whatnot on the covers (I was a big fan of fantasy art, especially dragons). The first book I remember reading was EQ#13: Dragon of Doom. It was probably that book that single-handedly gave me an unsatiable appetite for storytelling and adventure gaming that eventually led me to the world of roleplaying games via Dungeons & Dragons. I still have a handful of Endless Quest books and I am always on the lookout for more (so if anyone has any that are looking to unload them, let me know). Fast forward about fifteen years to when I was teaching myself Actionscript and needed a simple project to practice states and frame changing. I remembered those classic days of choosing my own adventure path with Endless Quest books and decided to make a short tribute to those books that sparked my passion for the roleplaying game hobby. While backing up my system, I just happened to stumble across my Flash version of a Choose Your Own Adventure book and figured I would share with my readers. Also, I am aware of several spelling errors, but I haven’t had the opportunity to revisit the project to make changes. I recently rediscovered my old EQ books and have been slowly trying to collect all of them in the series. Good luck finding the licensed Tarzan/Conan ones. Those seem to be a bit pricey as the Tarzan/Conan collectors are also after ’em. .-= Sniderman´s last blog ..Dangerous Encounter: The New Village =-.